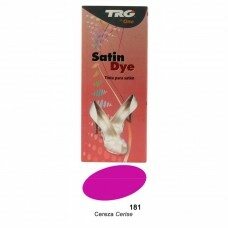 Cerise Satin Dye Kit by TRG "the One"
Dyes and restores satin, while preserving the satin finish. Water resistant in 24 hours and is easy to apply. If the shoe uppers are soft, pack then with tissue paper to keep them in shape. Start dying on the seams and the area next to the shoe sole by using the brush (supplied in kit). Then soak the applicator sponge (included in kit) and spread the TRG Satin Dye (supplied in kit) evenly over the shoe. Repeat with additional coats if needed to achieve a deeper colours. Allow to dry for 24 hours before wearing when the colour will become water resistant. The product was designed with the wedding trade in mind, particularly wedding shoes. “We were repeatedly asked to produce a Satin Dye..." says Joaquim Tarrago, the company owner.